John Ernest Bode (1816-1874) has given the church one of its most enduring hymns of Christian discipleship. It was so popular that Bishops in the Church of England were weary of singing it and discouraged its use at confirmations. Born in London, John Ernest Bode was educated at both Eton and Charterhouse, as well as Christ Church, Oxford (B.A., 1837; M.A., 1840). 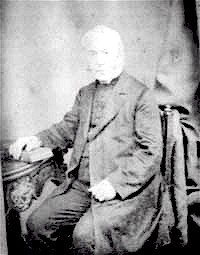 His service as a Fellow of Christ Church (1841-1847) included taking Holy Orders as deacon in 1841 and priest, 1843. Bode served as a vicar at Westwell, Oxfordshire and Castle Camps, Cambridgeshire. A high point in his life was an invitation to deliver the prestigious Bampton Lectures at Oxford (1855). The lectures were later published as The Absence of Precision in the Formularies of the Church of England, scriptural and favourable to a State of Probation, an anti-Catholicism tract delivered in the face of rising success of Catholicism in England at the time. His academic aspirations were sidetracked when he was defeated for a Professorship of Poetry at Oxford in 1857 by the distinguished and influential poet Matthew Arnold (1822-1888). In addition to books of poetry, his major hymn publication was Hymns from the Gospel of the Day for each Sunday and Festivals of our Lord (1860). Our hymn has its origins in the confirmation of the poet’s daughter and two sons in 1866. It was published two years later as a leaflet by SPCK (Society for Promoting Christian Knowledge) entitled “Hymn for the newly Confirmed” and later in the New Appendix to the New and Enlarged Edition of Hymns for Public Worship (1870), and in Church Hymns and Tunes (1874). When it was published in the second edition of the popular Hymns Ancient and Modern (1875), the success of the hymn was assured. Most major hymnals have included it since then. The text is based on a verse in John 12 following Jesus’ triumphal entry into Jerusalem and his travel to Bethsaida of Galilee just before his impending passion when he shares with his disciples: “The hour is come, that the Son of man should be glorified. Verily, verily, I say unto you, except a corn of wheat fall into the ground and die, it abideth alone: but if it die, it bringeth forth much fruit. He that loveth his life shall lose it; and he that hateth his life in this world shall keep it unto life eternal. If any man serve me, let him follow me; and where I am, there shall also my servant be: if any man serve me, him will my Father honor” (John 12:23-26, KJV). Close by the pierced side.